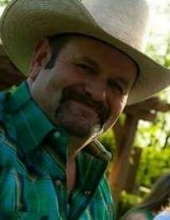 Celebrating the life of Jerry Wayne Long Sr.
Obituary for Jerry Wayne Long Sr.
Funeral services for Jerry Wayne Long Sr., 53 of Athens will be held at 2:00 P.M. Saturday, February 9, 2019 at Autry’s Carroll-Lehr Funeral Home with Bro. Bryan Prickett officiating. Mr. Long passed away on February 4, 2019 in Athens. Jerry Wayne Long Sr. was born March 26, 1965 in Athens, Texas to Minnie Lee Long and Willard Sampson Long. Big Jerry was fun to be around. He was very witty and could make you smile and laugh. He was smart and knew his stuff. There wasn’t anything he couldn’t build, and if something was broke, he was sure to fix it. He lived life the best he knew how and loved his kids and the grandkids even more. As they would say he gave the BEST hugs, and would tell them “Call me anything, but don’t call me late for dinner.” Although, he did not live his full life for the Lord, he made his way to him in the end. He accepted Christ as his Lord and savior. If you were lucky, you had the chance to hear the story of “His Ace of Spades”, he would tell you this was the determining factor on his journey to Christ. Hopefully, you had the pleasure of knowing such a great, wise man, who will be loved and missed dearly by many. He was preceded in death by his parents, sisters: Virginia Jones and Margarette Bewley; and brother, David Long. Survivors include his children, Tiffany Renee Hawkins, Jerry Wayne Long Jr. and wife JoAnne, Ashley Nicole Hurt and husband Ricky, Brannon Kieth Hollaway, and Carrie Ann McCoy. Grandchildren; Tiler, Cameron, Briley, Myranda, Gabriel, Tyler, Katelin, Montana, Sara, Abigale, Ricki, Zayden, Randall Jr. and Kerry. Great granddaughter, Tambrey. His siblings; Willard Lee Long and wife Saundra, Sara Jane Clayburn and husband Kenny, Merlin Kay Whittington and Mary Anne Hillhouse and husband Debbs, best friend Julie McNeel, and numerous nieces and nephews. Visitation for family and friends will be held Friday evening from 5:00 P.M. to 7:00 P.M. at Autry’s Carroll-Lehr Funeral Home. "Email Address" would like to share the life celebration of Jerry Wayne Long Sr.. Click on the "link" to go to share a favorite memory or leave a condolence message for the family.